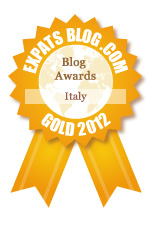 ExpatsBlog.com Expat Blog Awards 2012: Italy Gold Award! This blog won the Gold Award for best expat blog in Italy! I love this blog. It makes me open a window to Italy and to the author's life in a wonderful way. Like reading a novel by chapters. It's an addiction!!! I think this blog is fantastic- it gives a really authentic glimpse into life in rural Italy. i always look forward to her next posting! a wonderfully written slice of life. I love following this blog. It is so well written, and fun to read, that I can escape my boring life in the states. Liz has a magical way of pulling you right into her Italian world. Well wriiten, very entertaining and always touches your heart. Its like we are chatting over espresso and cookies in her kitchen. You feel like you are THERE. Awesome read! Reading this makes me want to pack my bags and go! Just not to the "mare" though!! A great read and a romantic setting. I love hearing about someone throwing caution to the wind and following her dreams...Go Liz, Paolo and now Miss Naomi! The blog is well written and generally has interesting topics. It is fun to hear about how life in Italy is the same, yet different, as our own. Wonderful blog! A great peak into a different culture and how an American is affected by her new Italian life. I just love the wit and insite in these blogs. This blog is one of my absolute favorites! Who hasn't fantasized about packing up and moving abroad? It's witty, funny and moving, often all in the same post. Elizabeth's love of Italy, it's history and her adventurous spirit resonates in her writing making her stories evocative and fun to read. 'My Village in Umbria' is thoughtful, poignant and humorous. Every new blog post makes my day! I adore this blog and love it when I open Facebook and find Liz has posted a new one. Whether she's making me laugh out loud in "Got Milk" or shed tears for a woman I'll never know in "A Sad Goodbye to a Woman I Never Met", it's always a truly great read. I love this blog because A) it is charmingly written. B) because I too am an ex-pat living abroad and C) it is educational and brings another place in the world into my home and onto my radar. This blog gives me hope in the human race, in love and in life. It is always real and always a delight! This is a great blog. Check it out for insightful, witty and touching snippets of life in Italy for an American ex-patriot. One of my favorite things to see when i open Facebook; a new posting from Liz Heath. Keep 'em coming! Delightful, well written & thoroughly entertaining glimpse of life from a perceptive observer and participant in a wonderfully unique community that has become one of our favorite places in the world to visit. Elizabeth writes with style and insider insight and above all with empathy for her location. We lived in Italy for 7 years, now relocated to Lisbon, but it's writing like hers that keeps us connected to a country we love. Excellent! ItÂ´s funny, enjoyable, sensual... very Mediterranean. At the same time, she knows how to keep it a bit acid. And her writing flows graciously. This is a wonderful blog! Liz's writing is moving, personal, educational and wry. What a great way to connect to a special part of the world and a very special family and community. Wonderful writing. Deeply personal, with great humor. Definitely one of my favorite places to take a break with morning coffee. I look forward to reading this blog. Liz has a wonderful way of giving you a glimpse of her life in Italy. Her writing invites you in, as if you were sitting on a sofa listening to her talk instead of reading her blog. Liz is brilliant, and her writing confirms the wisdom of her move. She is thoughtful, daring, and honest (all qualities that drive big life changes). Frankly, I am jealous, but we're not here to write about my problems. Speaking of problems, I love the candor in Liz' writing; she clearly loves her new life but isn't shy about its challenges. And she writes of it in a witty, relatable style. Bella! Liz's writing paints a vivid picture that transports readers to a beautiful country. Makes me want to move to Umbria! brava liz riesci sempre ad emozionarmi !!! I always look forward to reading! Only the second blog I've followed and I really enjoy hearing about life in Italy, a country where I'd love to visit someday. Paints a very interesting, and inviting, picture. Thank you! This is a great blog for people who have visited Italy as well as those who dream of going there someday. Liz's writing is lovely and captures the beauty and nuances of every day life in Umbria. Alwyas waiting for a new post!! Crazy about going to Italy this next spring!! I would love to visit Umbria!! Leggere con quanta ironia e spirito d'osservazione Liz racconta cio' che avviene intorno a lei nella sua terra d'adozione mi fa sorridere e riflettere molto.Aspetto sempre con ansia la pubblicazione di un nuovo post.Complimenti Liz! What an inspiring blog. Your posts are heartfelt & I just want more! I love the way you & your husband met & your descriptions of life in Italy! Thank you & please continue inspiring! Such a wonderful blog! I always look forward to new postings! I envision this blog becoming a book - it provide refreshing and personal insight into life in a foreign country. As a former expat, I appreciate the richness of the descriptions and the depth of the writer's feelings. The writing is high caliber and is more engaging than many published novels out there. Kudos, and I would love to see it receive a much deserved award. Thank you for sharing your life! It makes me want to go there NOW! Beautiful writing!!! I love this blog - I've never been outside of North America in my life, but reading about Liz's life/adventure in Italy makes me feel like I'm there. Elizabeth's blog is inspiring yet realistic. You can see and feel her love for Italy and its culture... Definitely, a beautiful way to share her life!! I love Liz's blog -- not only is she a terrific writer, her life stories keep us connected and reminds me that the world isn't so big after all. Bravo, Liz. Keep writing and sharing. I read the blog whenever I can, and really enjoy your observations on your new life. You're a great writer! Beautifully written, witty, passionate, fun, and elegant. Great reading! My eyes and heart have been opened to a beautiful country and way of life! I can hardly wait for each new chapter to emerge! Beautifully written. Rich imagery and delightful humor. I always look forward to the next post! Love this blog! Well written and fascinating look at Italian culture through the eyes of an American. This is a great Blog. I love it and want to move to Umbria as a result of what I read here! Liz is such a wonderful observer and writer. Her work is always witty, beautifully written, and insightful. Her blog is a wonderful escape into another world, but she doesn't shy away from discussing some difficult realities at the same time. This blog is a lot of fun to read, and it encourages readers planning a trip to Italy to go off the beaten path and explore some smaller destinations in the countryside. Liz can write. I'm not much into blogs but I love this one! I got in on Liz' blog from the first post and can't wait for each new one. Her writing skills are top notch and I always feel like it has been a few moments well spent after reading one. I spent a couple of hours reading this blog when I first discovered it! I know Umbria pretty well though I now live far from it, and this warm and beautiful blog takes me back to a place I love. Love this blog. Makes me want to move to Italy every time. What a great way to escape a cold, dreary day in Baltimore and be transported to the soft, rolling hills of Umbria. The author has a beautiful, lyrical writing style that all but makes you feel you are experiencing her wonderful life in the village of Allerona. I didn't need the photos to experience the landscape, the hands on adventure and the familial pride and delight of harvesting your own olives and tasting their delicious, rich oil on a yummy piece of bruschetta simplice. Gratuitous pics of beautiful Italian American baby girls are just the icing on the cake of this delightful expat's blog. Bravo!!! Every entry on this blog is like taking a mini-vacation. I look forward to each post and save the read for when I can really enjoy every word. Thanks, Liz! I truly look forward to new installments. Makes me nostalgic for the time I spent in Europe. Great writing Liz. I love how honest you are the most. Fantastic blog, I am filled with laughter and envy upon every reading. What a great way to live life and love Liz's humor and outlook. Wish we Americans could learn from this, live in the moment and appreciate our bounties no matter how small. I can't wait to read more! This is my new therapy, helping me escape the ordinary and experience the wonder of Liz's Italy!! I am insanely jealous!